Adele Budnick was born in 1963. After graduating from the University of Utah with a degree in Journalism/Broadcast Newswriting, she did what so many graduates do—pursued a job in an entirely different field. Thus, in 1986, she became a flight attendant for America West Airlines. During the nearly seven years she worked for the airline, she read hundreds of books (most of them romances), including one in particular about getting a romance published. In 1990, Adele decided to write her first romance novel, though it took her three years to actually sit down and do it. 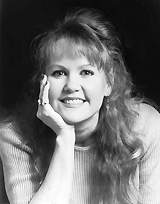 In the spring of 1993, Adele resigned from America West Airlines to pursue writing full-time. She finished in April 1995, the manuscrit, My Darling Caroline, and two years later, her hard-working agent sold it to Berkley/Jove. My Darling Caroline, released in October of 1998 as Adele Ashworth, went on to win the prestigious Romance Writers of America RITA Award for Best First Book of that year. She lives in Texas with her family, spending most of her hard-earned money at Starbucks, where she's frequently seen chugging down coffee while typing out another fantasy that she hopes romance readers will someday enjoy. Adele Ashworth is currently considered a "single author." If one or more works are by a distinct, homonymous authors, go ahead and split the author. Adele Ashworth is composed of 3 names. You can examine and separate out names.